While the words 'Volvo estate car' might conjure up images of ancient old boxy things with as much room as a van, the V60 isn't quite that practical. It's the smallest estate car in the firm's line-up, but its 529-litre boot space is still the biggest in its class. Access is easy, too, thanks to a wide-opening boot with an electric tailgate (standard across the range) and no irritating lip to lift things over. The V60 is longer than rivals, so as well as having a bigger boot there's also more space for front and rear passengers. Head and legroom is generous in the back, with enough room for two tall adults in the rear. There are also Isofix points fitted to the outer rear seats, making it easier to fit child seats. Just how opulent the V60 feels depends on which trim level you opt for. The Inscription models are the most luxurious, with leather seats as standard and optional wood inlays should you wish. It's true that it's not quite as luxurious as the bigger V90, but the V60 can be made to be pretty special. With its sports seats, metal inlays and sports pedals, the R-Design takes a more German approach to entire design which will appeal to those used to alternatives from BMW and Audi. A nine-inch portrait touchscreen display is located in the centre of the dash, providing access to all the infotainment features you may require. It's easy and intuitive to operate as well as being fast to react. Apple CarPlay and Android Auto are a worthwhile £300 option if you want to access your phone's media library, although they don't integrate with the portrait screen as well as the landscape systems used in other cars. There's a 12.3-inch driver's information display replacing the dials on all models - a bonus as, while systems like these are becoming widespread, they'll often cost you extra. They're clear to use and help with directions when approaching junctions. Overall, the Volvo V60's interior is surprisingly spacious and pleasingly premium - while also being very different from rivals. You can even spec it in some interesting colour and trim combinations. Momentum models feature height and reach adjustable steering column, speed sensitive steering, three-spoke leather steering wheel with chrome trim, steering wheel infotainment controls, cruise control, hill start assist, power parking brake with auto hold function, drive mode settings, keyless start, dynamic chassis, automatic LED headlights with active high beam, autofolding heated power door mirrors, automatic windscreen wiper activation, electric tailgate, roof rails, roof spoiler, rear park assist, 17-inch alloy wheels (D3 and D4), 18-inch alloy wheels (T5 only), tyre sealant kit and compressor, two-zone electronic climate control, 12.3" TFT driver's information display, driver and passenger seat with power height adjustment and lumbar support, split folding rear seat (60/40), rear armrest with cupholder, City Safety with Steering Support (includes pedestrian, cyclist and large animal detection and front collision warning with full auto brake), oncoming lane mitigation, run-off road mitigation, run-off road protection, speed limiter, driver alert control with lane keeping aid, road sign information display, ISOFIX (outer rear seats), anti-theft alarm including immobiliser, nine-inch centre console touchscreen, voice activated control, DAB radio, Bluetooth. Momentum Pro adds leather upholstery, heated wiper blades, heated steering wheel, head-up display, rear armrest with storage and cupholders, keyless drive, headlight cleaning system, heated front seats, front LED headlights, power driver seat, handsfree tailgate. 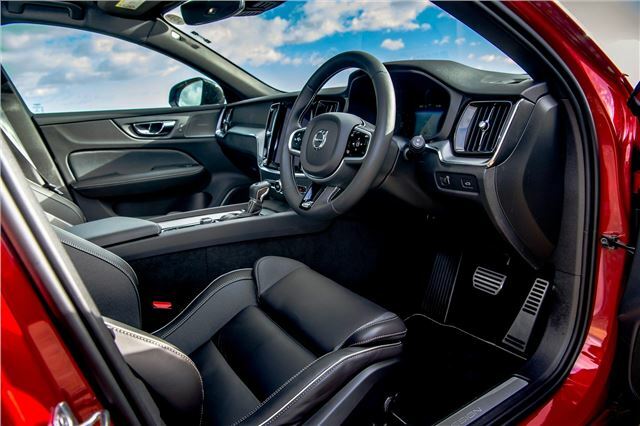 R-Design adds sports seats, front park assist, heated steering wheel, 18-inch alloy wheels, leather sports steering wheel with gearshift paddles (automatic), sports pedals, lowered sport chassis. R-Design Pro features heated wiper blades, dark tinted windows, heated front seats, handsfree tailgate, 19-inch alloy wheels, headlight cleaning system, head-up display, power driver seat with memory for seat and exterior mirrors, multicolour theatre lighting and puddle lights. Inscription models feature leather seats, power driver and passenger seats, front LED foglights, autodimming interior mirror, front park assist, 18-inch alloy wheels, chrome window surround, tailgate illuminiation, rear footwell illumination. Inscription Pro adds heated wiper blades, heated steering wheel, keyless drive, 19-inch alloy wheels, headlight cleaning system, heated front seats, head-up display, handsfree tailgate.